Variety is the spice of life. New Hampshire livens that up with a dose of New England charm and offers visitors a fabulous medley of family-friendly activities for a small New England state spanning just over 9000 square miles. From the White Mountains to the Lakes Region and the shore, there is a ton for either an adventure-seeking or a relaxation-minded family to do. We vacation here every year and never run out of options. In the fall, foliage beckons. Skiing is fun to do in the winter while spring brings fabulous hiking. It’s all about beaches near the lakes or ocean during the summer. New Hampshire with kids is a great place to be. In New Hampshire, there is no shortage of activities to rock your sense of adventure. 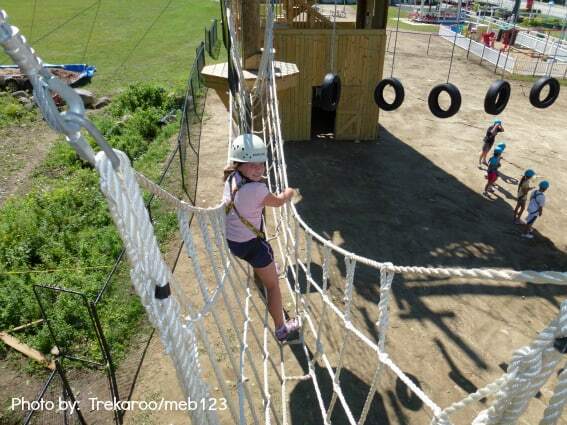 Consider some amazing zip lines and ropes courses. Gunstock Adventure Park, Cranmore, and Bretton Woods are all ski areas offering ropes attractions and/or zip lines in addition to skinning. Several other operators, including Monkey Trunks, have rope course options. Professional instructors will have you swinging on a ropes course or zip line in no time. To avoid disappointment, check for height and weight restrictions before telling the kiddos. We have tried both zip lines and ropes courses and I can tell you it’s much easier for the kids than acrophobic adults! If being attached to ropes via a carabineer is not your style, perhaps an alpine slide will fill your adventure quota. There is an alpine slide and mountain coaster at Attitash Mountain Resort in Bartlett. Kids as young as 2, with a competent adult, can zoom down the hill in a tracked sled. Be careful though, as it is not uncommon for adults to take the need-for-speed thing too seriously and end up with a bad case of road burn! The animal lover in your group might either like to try mushing or galloping. At Muddy Paw Sled Dog Kennel, sled dogs will take your family on a sled ride during any season. At Attitash, Castle in the Clouds, and the Farm by the River (seasonally), perhaps a reservation for some horse riding is in order? If the kids are not old enough for horseback, maybe book a carriage or pony ride? Ski Resorts provide great summertime activities: Check out why. New Hampshire offers some of the best hiking in the Northeast, if not the country. Great trails can be found in the White Mountains, the Lakes region, the Monadnocks, and more. One of our favorites is the Franconia Notch area, featuring hikes near the iconic Old Man site remains, the Flume Gorge and the Basin. 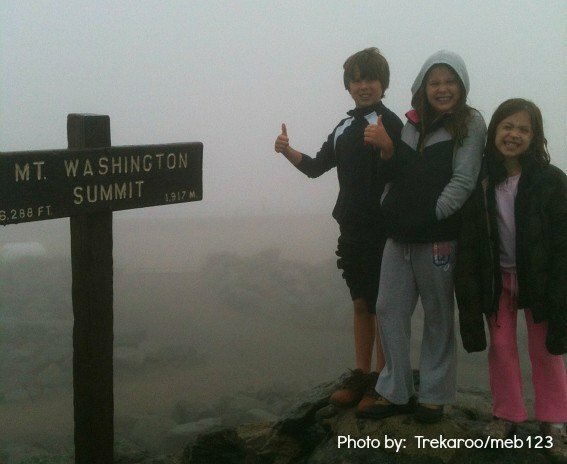 The best season to enjoy a family hike is any season! Spring brings the wet, wildlife, and wildflowers. Summer hiking allows for exploring watering holes and swimming areas after your hike, while fall provides terrific foliage. 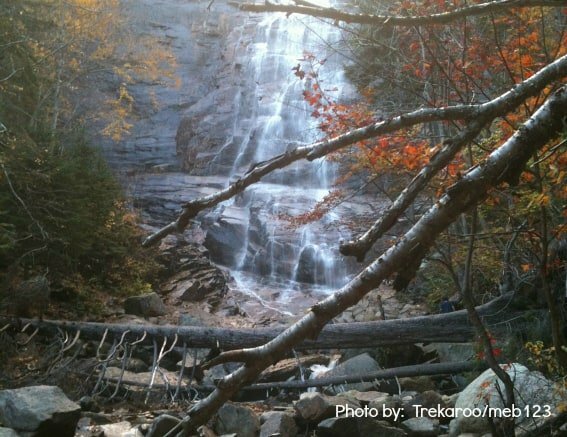 One of our family favorites is the Frankenstein Cliffs and Arethusa Falls loop. You can complete them alone or together. In winter, consider snowshoeing some of the flat trails. Just make sure you and the wee ones dress appropriately. The Old Bridal Path in the Lakes Region is also a great family-friendly snowshoe adventure. Those not interested in hiking but craving the outdoors might consider a moose sighting tour. Chances for viewing these humongous creatures increase the farther north you drive, however, many tour companies offer chauffeured drives with good odds of finding a moose. Gorham Moose Tours operates seasonally from a booth in the center of Gorham. You might also be lucky enough to spy one roadside on these rural drives, but take care driving at night to avoid a collision. Visit the McAuliffe -Shepard and Discovery Center dedicated to 2 American heroes: Christa McAuliffe, America’s first teacher in space, and Alan Shepard, America’s first astronaut. Families can explore the vast universe and many of NASA’s tools including Marvin the Martian Rover and scale models of the shuttle, as well as a 103-seat planetarium to study the stars. This is a perfect place for all of your space-loving kids! Other museums for kids to explore include The Remick Country Doctor Museum and Farm Museum, a place to explore the life of a country doctor with animals and hands-on exhibits that bring you back to another era. The younger set will also delight at the Children’s Museum of New Hampshire in Dover with ‘Build it Fly it’ and ‘Dino-Detective’ as some highlights. The Shaker people were a hardworking, communal people that flourished in the late 1800s. A visit to the Canterbury Shaker Village is a trip back in time and a perfect way to introduce kids to history and the workings of culture and religion. A tour guide takes you through the restored buildings where you can see how printing for the village and laundry for the residents were accomplished. You may even be able to participate in tasks or help harvest the garden. There is also a hands-on area for children where they can weave at a loom or go on a scavenger hunt. With a quaint Shaker gift shop where you can pick up some authentic woven baskets or the onsite restaurant, it’s a great way to spend the day. Be on the lookout for Dewey the Dog in pictures and stories. Our kids loved him! At the Strawberry Banke on the waterfront of Portsmouth, visit a neighborhood of restored houses that depict life and tell the story of shore settlers from the mid-17th to the 20th century. Stroll the streets and visit the homes and with period dressed docents. 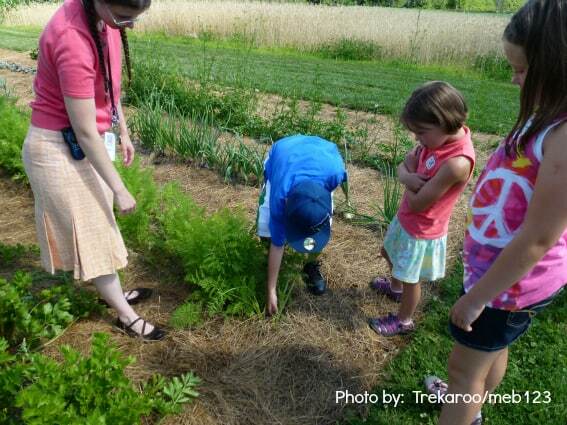 Learn about shore life through interpretive and participation events. This live museum is open May through October, and during select other times. Mount Washington, at 6200 feet, is the highest peak in New England. Although hiking is only for the hardiest due to the extreme weather changes and frequent rescues, there are lower peaks in the Presidential range (still family-friendly, yet quite difficult) such as Mount Lincoln and Mount Lafayette via the Falling Waters Trail. Choose wisely. Travel to the observatory in comfort while learning about the history of the mountain via the Mount Washington Auto Road either in your own vehicle or the chauffeured van. The Cog Railway is a train that will chug its way to the top via a cog system. It’s not for the faint of heart as the train slowly climbs its way up to the observatory and clinks its way back down the steep incline. Across the mountain, you may choose to take a ski lift to the top and see the peak from the top of Wildcat and ride the zip line back down in good weather. It is very unusual to get a good view from the top of Mount Washington because views are clear only a few days per year. However, if you are lucky enough to catch a clear day it is remarkable both from the top and the bottom. New Hampshire has a few excellent family-centered theme parks. Storyland, in the middle of the White Mountains in Glen, is designed for children of all ages. Children under 2 are allowed free admission. The theme is nursery rhymes and childhood stories. Little ones over 36 inches will enjoy rides in a beautifully-kept park. This park is open from Memorial Day to Columbus Day. Santa’s Village, farther north in Jefferson, also has beautiful views of the mountains and revolves around the Christmas Holiday theme. Santa is there whenever the park is open which is typically from Memorial Day to Columbus Day, and also seasonal weekends around Halloween, Christmas, and New Year. Christmas music is piped in and the park is designed and themed with a very Christmas-like feel. This is one of our favorite theme parks of anywhere we have traveled. You cannot be unhappy here. Farther down between the Lakes Region and Mountains, Clarks Trading Post allows families to spend a day with live animal shows, rides, and shows. Here, be on the lookout for the Wolfman who likes to keep people off of his property. Water loving little ones will enjoy these New England indoor waterparks as well. Find your own slice of heaven on the water in New Hampshire as there are no shortage of lakes. Options might include a fantastic family-owned resort on Lake Winnipesaukee, a rustic cabin on Squam Lake, or a beautiful home to rent on Lake Sunapee among others. Of course, each region has its own unique personality so you can easily find the lake that best suits your needs. 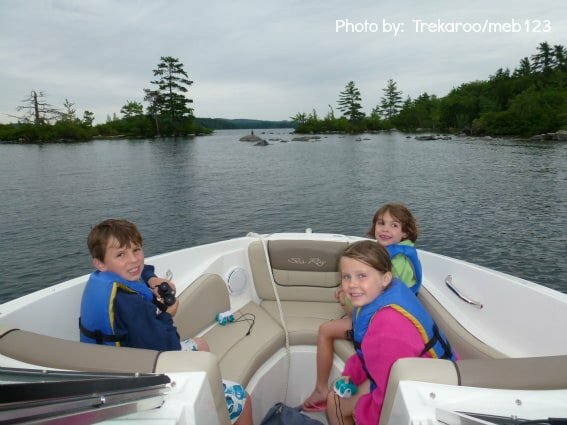 Winnipesaukee wins the prize for the most family-themed activities including seasonal outdoor water parks, Weirs Beach, mini-golf, arcades, ropes courses, go-karts, and bumper boats. Try Daytona Fun Park for a bit of each. Sqaum is a quieter and smaller, with more activity centered around the lake. Think of days swimming in the water, riding a boat, and exploring the shores. One of our favorite activities is to wake up early in the morning when the lake is like glass and watch the fabulous loons as they swim. Squam is also home to Squam Lake Nature Center. Several trails allow hikers to view rescued animals including cougars, bears, and raptors. New Hampshire might have awesome skiing, mountains, and lakes, but it also has a slice of sand on the Atlantic coast. Rated as one of the top 3 cleanest beaches in the US, Hampton Beach is known for fun and frolicking. 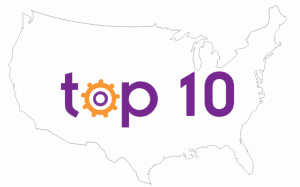 Folks spend leisurely days at the beach, camp, take part in themed beach weeks (including a children’s festival), catch a show at the shell, or have fun at Water Country, New England’s largest water park. There is a boardwalk for people watching and frequent evening activities at local resort hotels. 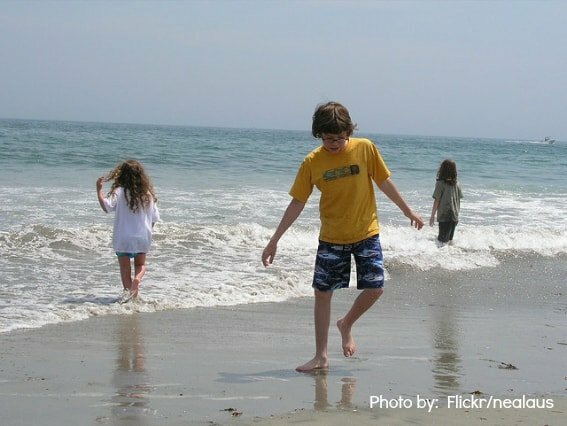 Kids have fun building sand castles, catching critters, or riding the waves. A stay at Hampton is a true low-key beach vacation with all of the family fun of a built up resort area. The appealing maritime city of Portsmouth is nearby with quaint shops, coffee cafes, restaurants, inns, and historic buildings. With its proximity to Boston, Portsmouth is a bustling New Hampshire city making a great center for your beach time. Winter time in New Hampshire is for skiing and boarding. This is the home of the White Mountains including many of New England’s highest peaks. Ski season usually starts in late November with the snow machines kicking into high gear as the downhill gang awaits additional contributions from Mother Nature. 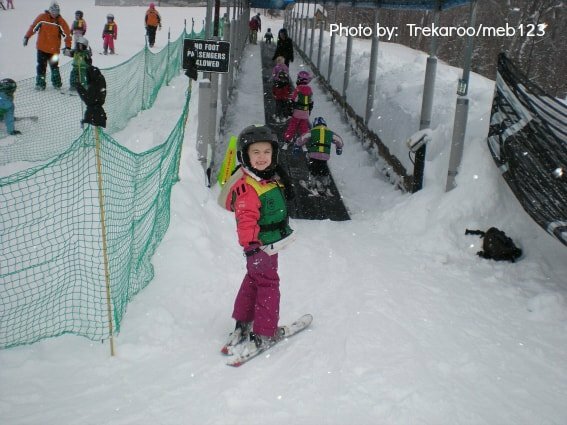 Cranmore in North Conway, Waterville, and Bretton Woods offer some of the most family-friendly skiing with a variety of trail options, accommodations, and lessons for skiing or boarding. Day-tripping to other mountains is also an option. Wildcat and Cannon have some steep trails for a more expert family of skiers, without resort amenities. Of course, many of these resorts also offer activities outside of the ski season. Cranmore has the Mountain Adventure Park while Cannon operates a large Aerial Tram for mountain exploration outside of winter and the New England Ski Museum. Cross-country trails and outfitters can also be found throughout New Hampshire where winter in the unspoiled land is refreshing and fun. Non-skiers might also think about snowshoeing. Finally, if you have a need for speed you might consider a snowmobile vacation. Winter in far north New Hampshire in winter almost dictates the need for a snowmobile. With over 6000 miles of maintained trails, your family can have fun on a snow machine for days. New Hampshire attracts families from across the globe to bask in the glory of its autumnal foliage. Our kids always like to pick their favorite colors from the glorious forest that cover the mountains. 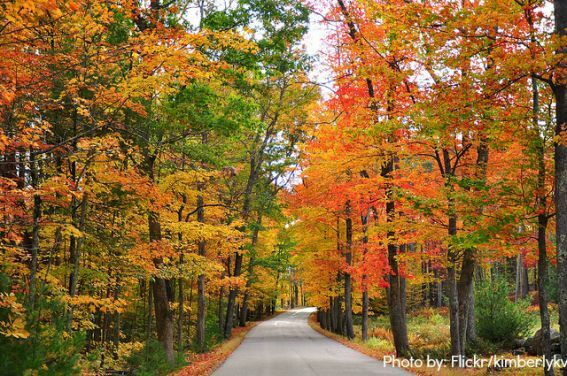 Everywhere you can drive or hike will provide some terrific glimpse of this fall spectacle. Some of our favorites include the Kancamagus highway where pullovers allow stopping points for terrific views and historical sites. Heading down 93 through the Franconia Notch area is also terrific. 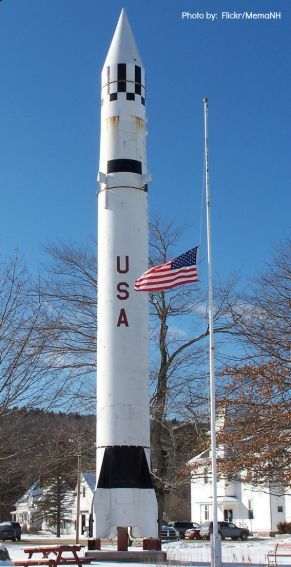 The Monadnocks Region centers around Mount Monadnock and the Monadnock State Park. Think of a picturesque New England scene and you will envision the Monadnocks. It’s an under-developed area with pretty inns, town greens, farming fields, hiking trails, and scenery. During the fall, try to check out the Keene Pumpkin Festival, an annual tradition where every year brings a world record attempt at the greatest number of lit Jack-o-Lanterns. Not to mention there’s some of the best foliage around. Pack up your gear and get out exploring the fun that New Hampshire offers! Fabulous job, Michelle! 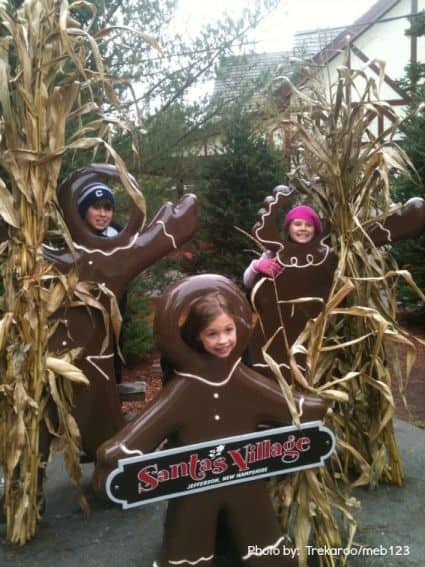 New Hampshire looks like a family friendly vacation destination any time of the year! Thanks for sharing with us all the wonderful things there are do as a family in New Hampshire. You have me ready to book a trip for this summer. Can’t wait for an opportunity! I’d love to visit New Hampshire with my little boy! Mt Washington, listed here at 4500′, is actually at 6288′! There are 48 peaks above 4000′ in New Hampshire to hike.